As a kid - even up through college - summer seemed to last forever. Two months felt like an eternity to do with as you please - and by the time September rolled around, you were for the most part ready to head back to school, to see your friends, to tackle the excitement of a new year and what it might bring. Now, with a full-time job and year round responsibilities - summer seems to pass with the blink of an eye. We are blessed in Southern California that the Fall and Winter don't really get that bad...(another reason I will probably never leave) - the weather is pretty much great all the time (relatively to say, Toronto) with the exception of February and June. But those summer months, where the sun seems to shine even brighter, and the air seems to be denser with promise of carefree adventure - are still incredibly precious. It's the time of year where you want to be outdoors, as much as you can - for me, that does NOT mean roughing it on bare bones campgrounds, but more like grabbing good food, with great company, al fresco. So I was excited when I was invited to check out Katana, a robatayaki/sushi hotspot featuring outdoor dining on its patio overlooking Sunset Blvd. The place feels like a hidden gem, located on the second floor with a barely visible sign that's easy to miss while driving down Sunset - the biggest landmark being its neighbor, The Comedy Store. You pull into the narrow entrance of the garage and take a questionably vintage elevator ride - that opens up to a serene, chic space that feels like a different world from the stereotypical Hollywood vibe on the street below. The interiors are modern Asian fusion, lush, dark, cavernous, ornate - with two large, open kitchens - one for robata service, the other for sushi - side by side. But we were there for the patio - a gorgeous space with dark, long rattan couches and a flowering fountain. Before our food arrived, we were treated to a tour of the kitchens and got to meet the chefs - checking out the open-flame, charcoal-fired grills and impressive glass case of skewers of every kind of meat imaginable. They use a special kind of charcoal here called binchotan, imported from Japan. It's a white charcoal that does not release smoke or unpleasant odors as it burns, letting the flavors of the ingredients shine through instead. Back on the patio, we started with the sushi side of the house - a beautiful presentation of sashimi that made us feel like we were on vacation. Flowers make everything better: edible gorgeousness. I usually don't love tuna tartare, but this one was super fresh and I loved the addition of briny caviar, and the counterbalancing crunch of wonton 'scoopers', with mayonnaise and sesame oil as well as soy sauce. One of the first skewers to arrive was also one of our favorites: Chilean Sea Bass ($5.25): super tender, juicy with a lovely sweetness balanced by a delicious robata char. Skewers are served with three dipping sauces: soy mustard, ginger and ponzu. Then, because I have a penchant for the unusual, there were Quail Eggs ($3), Chicken Liver ($3) and Chicken Cartilage ($2.75). The quail eggs got a little too rubbery on the outside, and the chicken cartilage was as to be expected tough and chewy - not ones I might get again - but I enjoyed the rich, flavorful chicken liver skewers. The more classic Wagyu beef ($20) skewers were tender, juicy, flavor-packed and another favorite. We also tried the Chicken Meatballs ($3.75) - a nice price point for those who just want small bites to go with their drinks, Izakaya style. The showstopper though was hands-down the Wagyu beef + lobster skewers with UNI TRUFFLE BUTTER ($26). During the kitchen tour the chef seemed especially proud of this one, and I was sold as soon as I heard the magic words Uni and Truffle. Here's a shot of the grilled skewer. SO delicious. Definitely the one to order if you're at a client dinner powered by an expense account. Those on a budget should not miss the Lamb Chop Marinated in Soy Garlic ($6) this might have been one of the best bites of lamb I'd had in the city this year. Sorry for the dark pic as we were having such a great time eating and catching up, that we didn't notice that our meal was heading into like the third hour until the light started changing on us. All in all, a fantastic time and great spot to 'choose your own adventure' especially during summer - whether it's after work drink and small bites, or for a splurgey client meal over an iconic stretch of Hollywood literally and figuratively elevated above the fray. Note: On the weeknight that we went, it had a very relaxed, serene vibe until closer to 10pm when the patio got more crowded, and noticeably louder. We heard on Saturdays the patio gets more packed, with more of the Hollywood crowd, so plan your visit according to whatever you're more into. Imagine a place where they serve uni, which may not be live, but are caught daily and tastes fresher than any live sea urchin you've been able to access at any given local farmers market. Imagine a place where they center their *entire* menu around this tastiest of delicacies. And then imagine that a *bowlful* of this fantastic sea urchin costs UNDER $13. And then completely die of happiness when you realize that this place is REAL, and it's just a short drive down to Torrance. That was me, having a lucid dream that came to life, last Saturday night. When it comes to Japanese food in LA, it seems that the best spots are tucked away into strip malls or other off the beaten path venues. At least that is true of my favorites: Asanebo, Sushi Iki (post to come), Sushi Gen and Marugame Monzo. Maruhide Uni Club also has this qualifying trait - it's in a strip mall off Redondo Beach Blvd in Torrance, neighbor to a beauty salon, dental and optometry offices and other shops that are far from making the mall a dining destination. Once you're inside, it's a serene escape from its outer surroundings: the design feels like what I would imagine a family run restaurant from the 90s that aspired to emulate a western tea room from some resort hotel/country club in Japan would look and sound like, complete with soundtrack of classical music. ...like the foodgasm inducing uni Specialty Bowls. They all feature uni, but you can select from combinations with sashimi staples like ikura (salmon roe), scallop, tuna and/or salmon. All bowls come in two sizes: Regular (comes with uni egg omelette, uni soup and salad) and Mini (comes with uni egg omelette and uni soup). Since you know my feelings about veggies at this point, you know that I went right for mini (though I do want to see how much larger the Regular bowl is on my next visit)! And, as an unrepentant uni fan, I had to go for the bowl with ALL uni. The first thing to arrive was the uni soup, a light and refreshing clear broth with slivers of onion and pieces of uni - a great tease for what's to come. Specialty Bowl #4 was basically Uni 4 ways: Fresh and Boiled Sea Urchin & Marinated Sea Urchin + the uni tamago (Japanese style omelette) that came with every bowl: at the risk of sounding like an infomercial or bad car dealer spot, I have to say "all for the insane price of $12.60"!!! Fresh: fantastic Santa Barbara sea urchin, among the freshest I've had in the city, though not the absolute best - leaps and bounds above anything you can get at the farmers market (live uni doesn't always mean great uni), or at Quality Seafood and SO MANY MORE PIECES for the price. Boiled: I've never tasted uni boiled before Maruhide, and this prep really tames the pungent marine funk that I love (but that may make it more palatable for people who don't love that as much) while creating a texture that for some reason reminds me a bit of bottarga - not at all as dense overall, but I mean in terms of each orb of 'roe' (ok really, gonad on uni) comes to stand out and make its presence known, texturally. I still love the fresh more but it was really interesting to taste uni made this way. Marinated: this is also a first for me - uni marinated in kombu-shoyu or kelp soy sauce. It's like the different ways uni is prepped as it appears on this bowl can be placed on a spectrum of intensity of funk: in which case, it would go from boiled (mildest) to fresh, to marinated (super funky). Its creamy blast of umami is scooped onto what looks like a lilypad but is a thin slice of radish. This tastes amazing with the perfectly cooked sushi rice underneath. Uni 'omelette': this was my second favorite after the fresh uni. It's basically tamago - slightly sweet egg formed into a smooth textured 'cake' - with uni paste rolled into its layers. Amazing. I could eat these (plus that fresh uni) every day for the rest of my life and die a happy uni-eater. 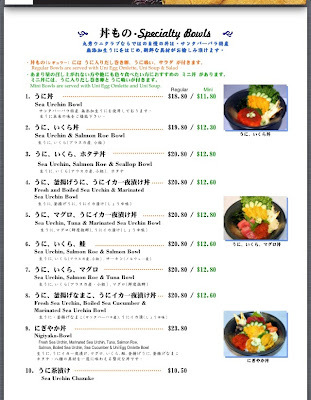 Aside from the specialty bowls, they do also have other delicacies that will light food lovers' eyes on fire, like sea cucumber carpaccio, 'tongue stew' and things that I need to try on my next visit: grilled sea urchin, and sea urchin cream pasta (need to see how it compares to Marugame Monzo's uni udon!). Maruhide's restaurant has only been open for a few months. I loved that I was able to slide in for a table easily on a Saturday night. But since the LA Times scouted and wrote about the place, I'm not sure how much longer before the place starts popping, and was glad that I was able to experience it before the place is overrun. So ecstatic that a place like this exists and Maruhide, may you live long and prosper!!!! Yeah so I went back last night with friends @miffyeats and @munchabout, and made much better (and many more) choices. We went on a bit of an uni bender! First up was the Fresh Uni Sashimi ($12) we INHALED this one, the perfect platter for purists, and yes at an insanely great price. Sated with the pure uni experience, we were then able to move on to the 'new' (at least to us) preparations we'd never tried before: in the "shutou" section. These are basically sea urchin 'preserved' in various marinades or frozen. We got the sampler where you can experience 3 kinds (from 6 options): Ruibe was the most unique, almost like a frozen sea urchin terrine that could well serve as dessert. The other two were whole uni marinated in various sauces, and presented in cute little round containers: Shutou with Yuzu Chili was my absolute favorite from this plate - the tartness and slight heat enhancing the taste of the plump tongues of umami. Shutou Original was also delicious, but not one that sends your Foodie Senses tingling like the others. I couldn't leave without trying the Grilled Sea Urchin ($12) which tasted fresh off the robata grill, delicious with a fragrant smokey char and delicate crisp warmth on the outside, and cool with the familiar and unique texture of uni on the inside. With light sprinkling of salt on top to bring out flavors even more and add contrasting crunch. Instantly addictive and what I will make sure I get every time I come to Maruhide. I haven't seen grilled uni offered anywhere else in LA (on its own anyway) - if you come to Maruhide don't leave without trying this. And because this really is how much we love uni - while munchabout wisely chose Specialty Bowl #9 (Nigiyaka) which offers more variety to sample with uni accompanied by various fish sashimi over rice....miffyeats and I - true to our singular obsession devotion - EACH got a Regular-sized Specialty Bowl #1 Sea Urchin Bowl ($18.80). Our server was kind of in shock and asked twice to confirm whether we really wanted to add two bowls after all we'd already inhaled. The answer of course was YES, YES, YES. On my previous visit I had questioned whether I wanted to larger size especially when it also came with salad. We realized when our orders arrived that the Regular Bowl may be the smarter choice. The bowl anyway was about three times the size of the 'Mini' and still under $20 (just $7 more than the mini). The uni pieces were larger, and you get two uni tamago (egg omelettes) instead of just one. The salad as you knew I would say was meh, with ordinary looking and tasting greens and tomatoes but for those who care, also topped with uni mayo dressing. We were too full for dessert at that point (but no they did not have uni ice cream anyway). Maruhide is actually a retailer of uni as well - apparently their shutou is served on Japan Airlines in the first class cabin! - so it was fun, on our way out, to check out their refrigerated case of goodies. They do offer trays of uni to go, at various tiers of quality / pricing from factory farmed at $14 to fresh Santa Barbara uni in brine for $19.50 to premium fresh at $55. Maruhide recommends eating the fresh uni the same day though - so since we were (blasphemously!) too full of uni to take any fresh ones home, I picked up two boxes of the much loved Uni Shutou with Yuzu & Chili ($10.50 each) that can go in the freezer for that little taste of uni-topia (and apparently JAL First Class VIP treatment) during the week...while I count down the hours til my next visit to Maruhide!!! *For those who don't live within driving distance of Maruhide (i.e. out of state!) they do have an online store as well - enjoy! Update Spring 2016: unfortunately Maruhide the restaurant has now closed for business.